As a business grows, the need for a central customer relationship management (CRM) system becomes a higher priority. Note: This article was updated to reflect additional solutions and review data as of December 4th, 2018. To help small businesses, we created a list and in-depth analysis of the best free CRM software, based on real user reviews, ordered by highest user satisfaction. Startups and small businesses look to CRM software products to handle their growing lists of customer contacts and make sure invaluable leads are accounted for. However, especially for smaller small businesses, buying and implementing a CRM system can be expensive and time-consuming. The need for a central software-as-a-service (SaaS) customer relationship management system becomes a higher priority the larger a business becomes. Keeping accurate records of customer interactions becomes more difficult as the volume increases; without a place to house all that information, prospects, leads and potential revenue inevitably slip through the cracks. A cloud-based platform can keep this data stored as well as make it easily accessible to your entire workforce no matter where they are. Some CRMs may even have a social integration to make this easy. Small businesses and startups need a place to conveniently store their customer data, help forecast for the future and assist in marketing efforts. Luckily, based on reviews from real G2 Crowd users, we have compiled a list of the 14 best (based on user satisfaction) free CRM tools! While many of the online CRM companies on the list have a free trial service, a handful of services go as far as offering a completely free CRM tool. If you’re looking for a freemium CRM offering, this is the list for you. Use the free features until your business outgrows them, and then choose from more robust paid plans as your need grows. Some tools may even be open source, allowing you to customize them to your specific business requirements via user-created modules or through your own in-house development team. We’ve made this list to help today’s small-business professionals manage their customer relationships without breaking the bank — so buckle up, and get ready to unlock the wonders of free CRM systems in 2019 with this in-depth analysis from real-user reviews! 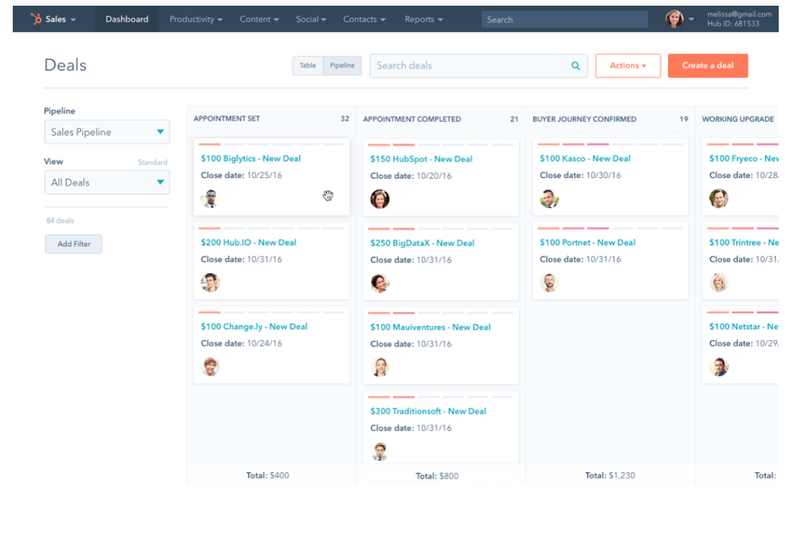 Free plan: HubSpot CRM gives you everything you need to organize, track and nurture your leads and customers — oh yeah, and it's totally free with unlimited users and contacts. Not to mention it provides tools to help track and run email marketing software campaigns, and has the ability to integrate with your choice of marketing automation software. Sounds too good to be true, doesn’t it? Fortunately for small businesses, it is 100 percent real and 100 percent free, forever. 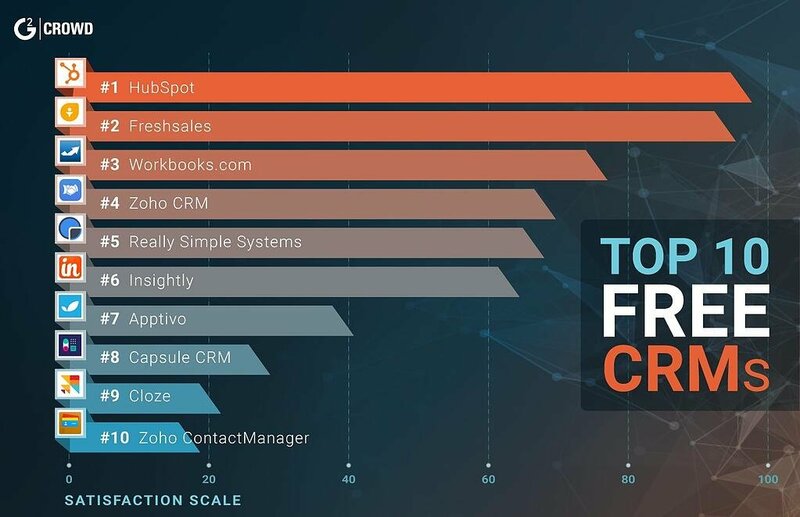 What users say: HubSpot CRM is the most popular system on this list, with more than 500 reviews coming from small-business users. Overall, it boasts more than 700 CRM reviews in total and has excellent marketing automation feature ratings, earning a high email marketing rating at 90 percent (well above the CRM category average of 78 percent). Users also noted the email tracking features, ease of use and custom sales pipeline creation as reasons why they love this platform. 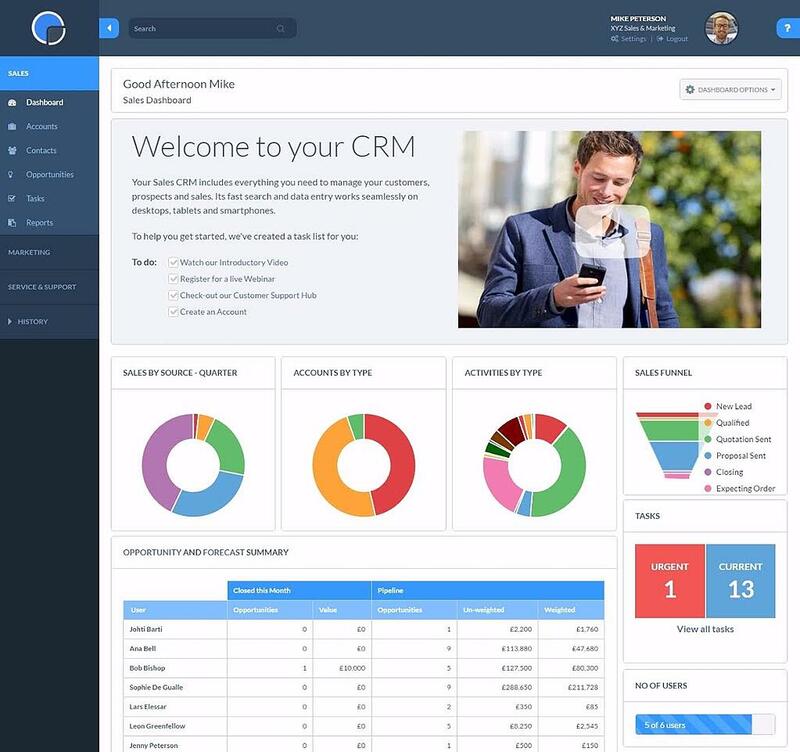 “If you are looking for a free (and highly functional) CRM platform this is the place to go. The ability to create/edit your own pipeline is terrific. I love the 'scrum' feel to the Deals Dashboard. Oh and don't get me started on the contacts. I love that I can put in some basic information about a prospect and Hubspot find additional contact information about the client.” — HubSpot review from Max J. J. 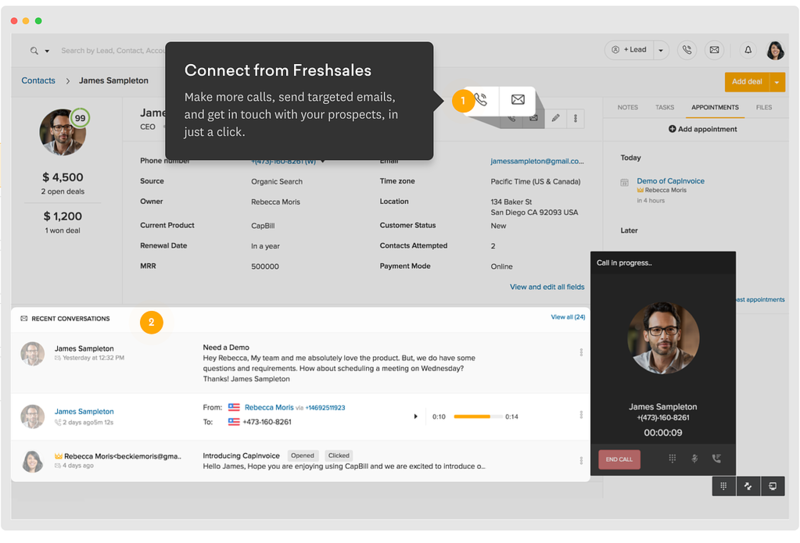 Free plan: The free CRM offering from Freshsales includes excellent features for the small-business user, helping manage leads, contacts and sales. It also offers integrations to Zapier for data integration, Freshdesk for help desk and ticketing, Mailchimp for email marketing, and Google Apps. These integrations help tie more aspects of your business together. Freshsales’ free CRM allows access for as many as 10 users, making it a great choice for a growing sales team. What users say: Freshsales is one of the highest-rated CRM systems in both satisfaction and feature ratings — it has a rating of 94 percent for Ease of Setup (category average: 82 percent), Quality of Support (category average: 85 percent) and Ease of Doing Business With (category average: 87 percent). Based on user responses, people believe Freshsales is heading in the right direction at a rate of 97 percent (compared to the category average 83 percent). Wow! “The flexibility of Freshsales’ processes and integrations. 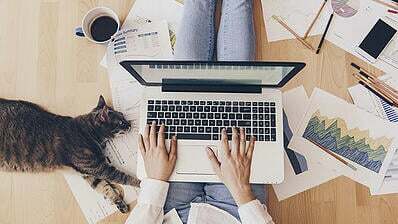 Everything, from phone interactions, emails and automation in general are completely centralized in an easy to maintain and manage interface which is accessible from anywhere an Internet connection and browser are available. And regarding integrations, major players such as Google Calendar (for corporate scheduling), MailChimp (for email campaigns) and its 'cousin', Freshdesk (for helpdesk and customer experience) are solid options.” — Freshsales review from Jose Q. 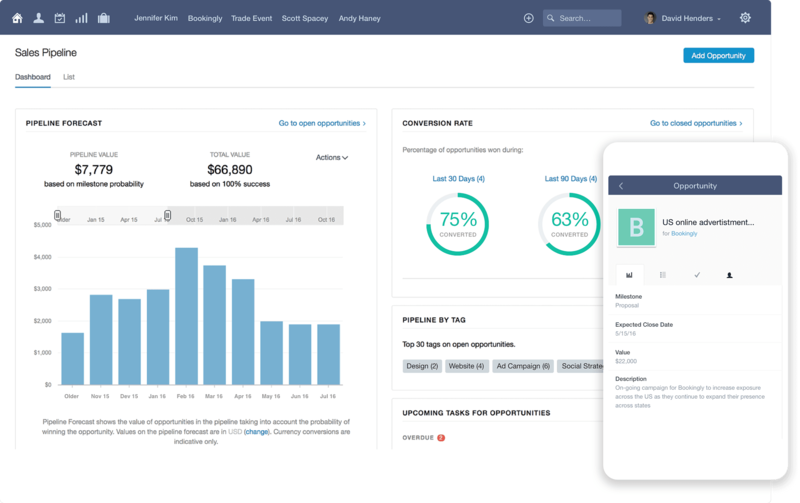 Free plan: Workbooks.com’s free CRM looks to bring sales reps, marketers and customer service reps closer together, all for free! Its free offering includes a two-user cap, but the platform gives you plenty in return. 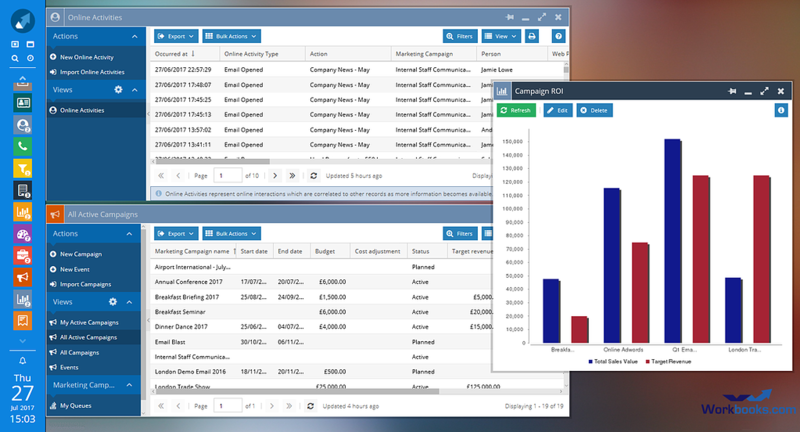 Workbooks.com helps track your leads, run and analyze your marketing campaigns, and build an inquiry database to improve customer relationships. What users say: Workbooks.com’s free CRM gives you a great deal of flexibility, and it's easy-to-use interface makes the complications of CRM tools much easier to manage. Users commented on how wonderful the customization features are, making it simple and quick to manage leads and build reports. This shows through in the data, with Workbooks.com earning a rating of 87 percent for the customization feature question (category average: 81 percent). “CRM software can often be very difficult to use, because of all the task it can do. Workbooks, however, has a beautiful user interface. The system is designed to look like Windows complete with a desktop and start menu, so it is very intuitive and familiar. The desktop is used to store the more frequent tools, while the rest is clever organized in the start menu. This means that you can always quickly find what you want as nothing is ever more than a click away, but unlike other systems, there is no danger of being overwhelmed.” — Workbooks.com review from Madhu S.
Free plan: Zoho’s name is heard often in the small-business world, and its free CRM tool is a great option for SMBs and startups alike. It provides detailed reporting features and has the ability to scale with you as your company grows. 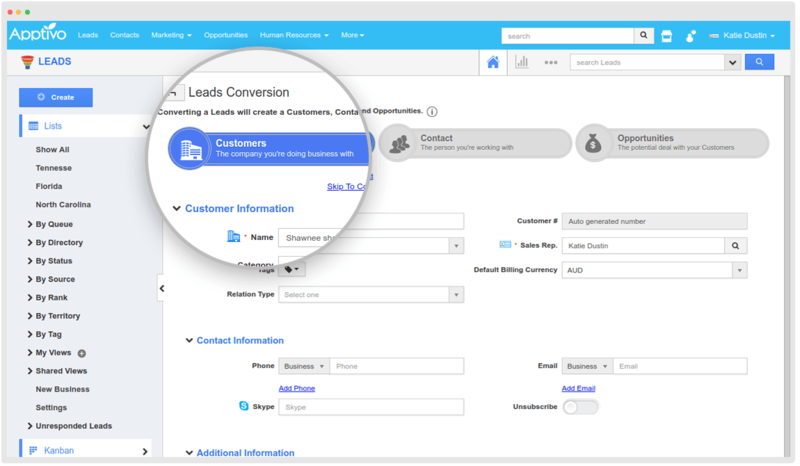 Zoho’s CRM free edition is good to go for up to 10 users. What users say: Users are relatively happy with Zoho’s free CRM offering, commenting that it provides small businesses with plenty of add-ons and has the ability to scale as your company gets bigger. 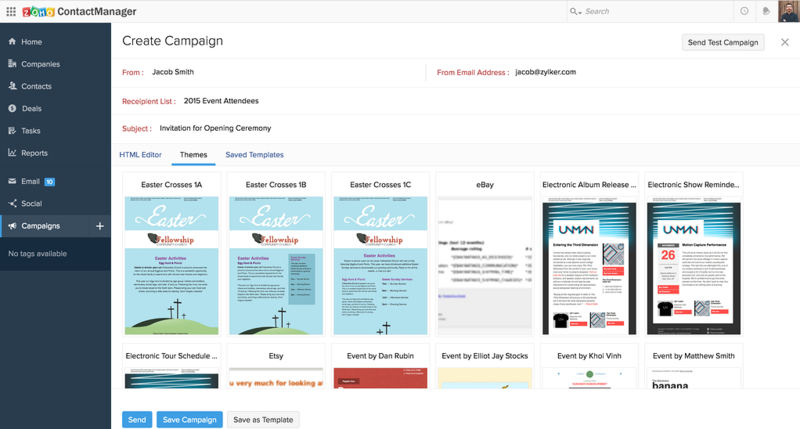 Some featured add-ons include Zoho Desk for help desk and ticketing, the accounting software Zoho Books and Zoho Campaigns for marketing purposes. This integrated approach allows users to effectively coordinate prospect information and opens communication lines across your entire sales department. “Zoho's suite of products not only allow me and my team to manage the core of our daily tasks and goals on a daily basis but allows full clarity of what our 'WHY' is that leads us to accomplishing major milestones. The ability to have a platform that offers so much at a price point so little (compared to many other CRMs in the market) is a huge win.” — Zoho CRM review from Matt M.
Free plan: The free CRM offering for Really Simple Systems is intended for small businesses, with the goal of making it, well, simple to use and providing all the tools necessary to kick your sales into hyperdrive. The free CRM is available for up to two users with no commitment period, so you can use it for free for as long as you like. What users say: With more than 90 percent of reviews coming from small-business users, Really Simple Systems’ free CRM certainly lives up to its name. It’s just plain easy to use! It is rocking above-average scores for Ease of Use with a rating of 88 percent (category average: 85 percent), along with a rating of 92 percent for Quality of Support (category average: 85 percent) and Ease of Doing Business With (category average: 85 percent). Plus, the no-strings-attached model doesn’t hurt anything. 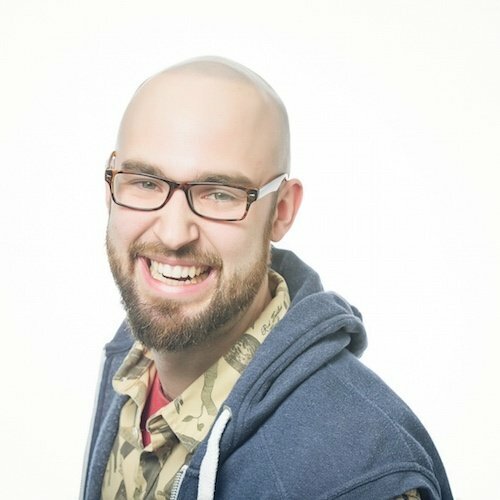 “I studied quite a few web-based CRM offerings. I ended up settling on Really Simple Systems primarily because I liked the look of the interface, the layout of the screens, and the data presented. It fits in with the way I want to track my sales opportunities and isn't too cluttered. Ultimately, my needs really aren't that complex - I want to keep track of my prospecting activities, have reminders of my next follow-up with each prospective client, and be able to see at a glance what my total opportunities amount to. Very nicely done.” — Really Simple Systems review from Kurt O. 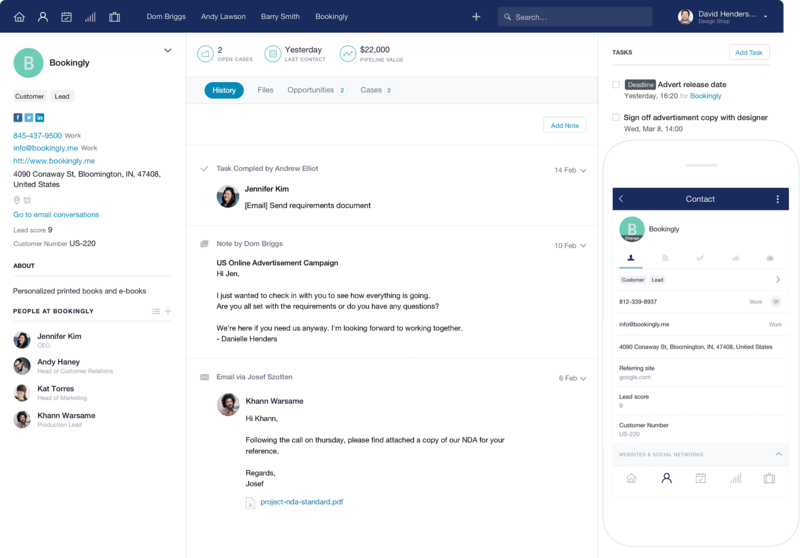 Free plan: Insightly’s free CRM offering gets you up to two users and has solid contact management features to build and nurture customer relationships. It also comes set with the capability for accounting integrations and custom email templates to stay on brand when reaching out to your customers. What users say: The free CRM offering from Insightly provides many functions to small-business users, allowing for smoother integrations with other marketing and customer service solutions. Reviewers mentioned the online interface as a positive feature, as well as the responsiveness and quality of customer support. “Free platform. Endless supports from the developer, I had an easy time talking to the customer rep and this is something new other CRM software offers to 'free user' This is amazing customer service. I found this very surprising product coming from the small company. 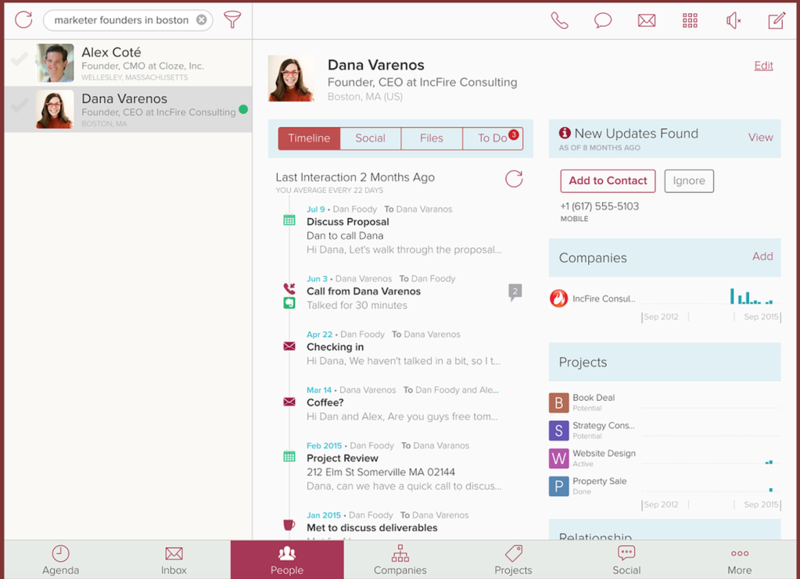 Lots of functions are included in the platform.” — Insightly review from Daniel S.
Free plan: Apptivo is truly a “do-it-all” type of solution, with its free CRM offering mainly basic functions such as reporting, advanced search features, and saved views, which are definitely helpful from those new to a CRM system. The free version caps users at three and allows for 500MB of stored data. What users say: While Apptivo’s free CRM solution might not be the choice if you are planning on loading it with customer data, the support team and vendor as a whole are great to work with (according to users). 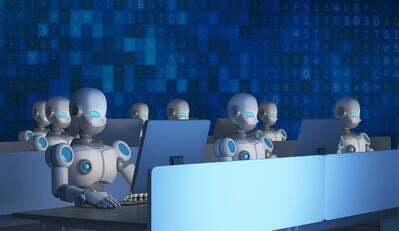 It has above-average scores for both Quality of Support (91 percent) and Ease of Doing Business With (91 percent), compared to the category averages of 85 percent and 87 percent, respectively. “Their customer service is awesome. They have a help button on every screen and, unlike most CRMs, this button pulls up a chat box, not a wiki or forum. Within seconds of a request a live operator responds and actually gives you real solutions. I was totally impressed the first time I used it and figured it was a fluke but I've used the support chat multiple times and each time a knowledgeable rep was there to answer my questions and help me try to solve my problem.” — Apptivo review from Dave G.
Free plan: The free edition of capsule CRM gives users an overall view of everything you know about your customers, prospects and other companies you do business with. The free CRM offering can be used by one or two users, provides your small business with 10MB of storage, allows for up to 250 contacts to be plugged into the system and provides custom fields. What users say: The free edition of Capsule CRM may be small on data storage, but users find it to be incredibly easy to set up. This product has a well above-average Ease of Setup rating (90 percent), and multiple reviewers commented on how quick and easy it is to get up and running. This is another solid choice for the smaller small-business person. “The user interface and customisable fields make it flexible but easy to implement at the same time. I implemented this into very different companies at once, each with very different customer management processes. Capsule adapted to both easily and simply.” — Capsule CRM review from Will S.
Free plan: Cloze’s free CRM offers a single view of your contacts from email, social media accounts and more. It also provides social media management software capabilities to filter and organize social feeds by quality of lead. What users say: Automatically managing contacts and estimating sales potential make Cloze’s free CRM worth a look. Big benefits to this free CRM offering mentioned by users include the ability to get a single view into many aspects of customer and prospect relationships and social media activity views as big benefits to this offering. “Cloze does an incredible job helping me stay on top of my to-do's while also giving me insight into where my time is being spent. It has been an invaluable tool for helping me keep my investment of time in the appropriate places.” — Cloze review from Bryan B. Free plan: Zoho ContactManager’s free CRM offering is, at its core, an online contact management solution which helps you organize contacts, tasks, leads and sales in a central place. It is free for only one user and lets you input up to 500 contacts and 10 deals, making this potentially a good option for the smallest sales department. What users say: Though it doesn’t have as many reviews as Zoho CRM, Zoho ContactManager’s free CRM solution is generally liked by users. Many reviews pointed to how this free offering helped streamline their contacts and track future interactions with potential customers. “I really like the general framework of Zoho Contact manager. It is nice and streamline and go to use overall. It really helps enhance your ability to follow up with, and track future interactions with potential businesses. I think across users it really helps what you are looking to achieve.” — Zoho ContactManager review from Eric L.
Free plan: Agile CRM is free for up to 10 users, providing up to 1,000 contacts and companies, custom data fields, lead scoring, appointment scheduling and email tracking. The free version also includes marketing tools such as a landing page builder and up to 5,000 branded emails. What users say: Many users praise Agile CRM for being simple and easy to use. Ideal for small businesses, Agile CRM may not have as many robust features as other CRM tools, but users appreciate the breadth of functionality for the price point. “Agile is a great "all-in-one" CRM with many tools for different user needs, bringing Sales, Marketing and Services tools in the same interface with integrations between them. Agile has a great free plan that give the users many features.” — Agile CRM review from Raphael S.
Free plan: Apptivo CRM provides a free starter plan for up to 3 users that includes up to 500 MB of data storage, basic contact sharing and standard reports. What users say: Apptivo CRM doesn't have as many reviews as other CRM products on G2 Crowd, but users are happy with the ability to customize the tool to meet their needs and the features that are available. Users also appreciate the ability to organize their workflows. “I like that I can choose how to implement the software. With a little up-front customization, which I have completed myself, I have made the software straightforward and intuitive for the way my business operates. I don't need to adapt to suit Apptivo, it changes to suit me.” — Apptivo review from Owen S.
Free plan: Capsule CRM offers a plan that is free for up to 2 users with 250 contacts and up to 10 MB of file storage. What users say: Capsule CRM users appreciate the simplicity of the tool as well as the ability to customize macros and email settings. 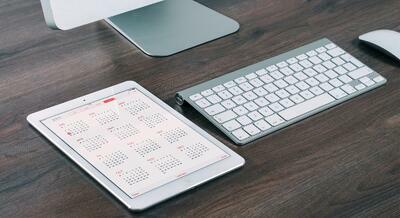 Users also appreciate the ability to schedule appointments that are synced to their calendars. “Capsule has all the elements I need for my small business to function well, and these elements are organized clearly in an incredibly easy-to-navigate system. I love that I can customize fields for my particular business, and that the sales pipeline tools give me a very clear picture of all my sale opportunities. The look is very clean! It also integrates with other systems I use (GSuite, Freshbooks, MailChimp, etc. ), and the support team is awesome. I've only had a couple of support issues and these were handled VERY quickly.” — Capsule CRM review from Elease L.
Free plan: RAYNET CRM’s free plan allows up to 2 users to maintain up to 150 accounts with 50 MB of storage. There are currently no RAYNET CRM reviews! Be the first to write a RAYNET CRM review. The upfront costs of most CRM systems can be intimidating and in some cases unattainable for startups and small businesses. 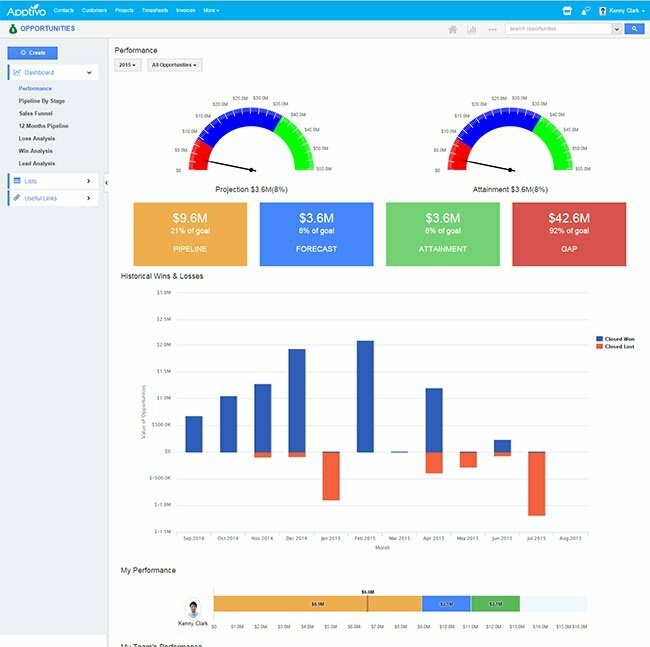 The CRM tools above provide small businesses with valuable lead management and contact management functionality while staying within a tight budget. All of the information above comes directly from real G2 Crowd users, all of whom have used and experienced the benefits of these free CRM tools. Check out our category page to learn more about CRM software and read the thousands of real-user reviews of customer relationship management software from sales professionals. There are other types of business tools that can be used in conjunction with one of the best free CRM tools highlighted in this list. Startups and small businesses with little budget in 2019 can look at other free lists with insights from real users to solve business problems and help organizations get the most out of the best free CRM tool they choose.